After five or six days in Bamako it was great to head out into the country. 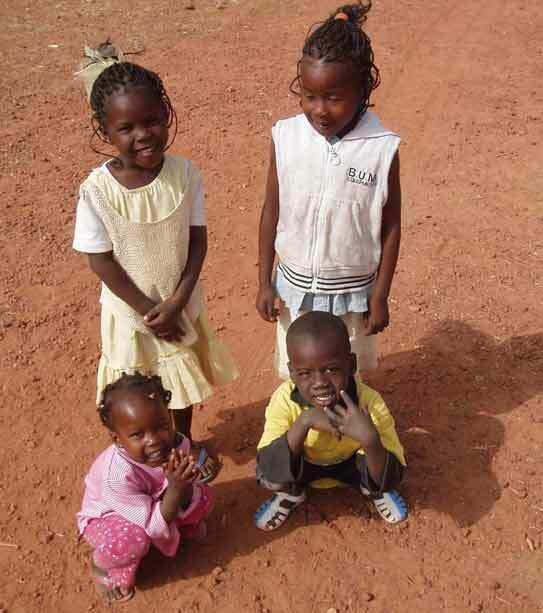 Camping out that night, I arrived in Mopti the following day and found the SOS Villages childrens orphanage a few kilometres outside town [ed. Mopti is 650km north-east of Bamako]. Bertrand Sargisson, a Franco/Anglo fellow overland biker, had made a few trips from England with medical supplies for them and in recognition of the advice he’d shared with me over the months of preparation for my trip, I had the intention of making a donation. I was received with a warm welcome and immediately took to the relaxed atmosphere of the place and the friendliness of the staff. And of course some of the curious kids who timidly approached with the refrain “tubabou”, white person, touching my pale hairy arms. Moussa Coulibaly [pictured left], the genial director explained that the villages are part of an international organisation started by an Austrian, Hermann Gmeiner, in 1949. He explained that their village had twelve ‘families’ or houses, each with about ten children and a ‘mother’ at the head, foster mothers recruited from around the area. There is a father figure, Moussa, and various “uncles” and “aunts” including Mareko, the jovial ‘educationalist’ and Nangnouma the secretary, to support the families. It seemed to establish what is important for a child’s early years – stability, individual care and attention, socialising opportunities, and of course education. The children were either orphans, or from destitute mothers who couldn’t provide for them. Financial support came from the childrens’ relatives when possible – sometimes a father or grandparents – as well as from Europe. When Paddy, John and Paddy (PJ&P) turned up the next day to meet me and also made a contribution, Moussa gracefully thanked us, declaring that the donation was appreciated, while adding that he subscribed to what he called ‘la politique nouvelle’. They were trying to be dependent less and less on outside aid, recognising the need for Africans to take responsibility for and find solutions themselves to their social problems. Which struck a chord with me as that was just the approach that appealed to me about SELF HELP, the charity for whom I am raising awareness and funds. Leaving my bike in the village, I hopped into a Land Cruiser with the lads. 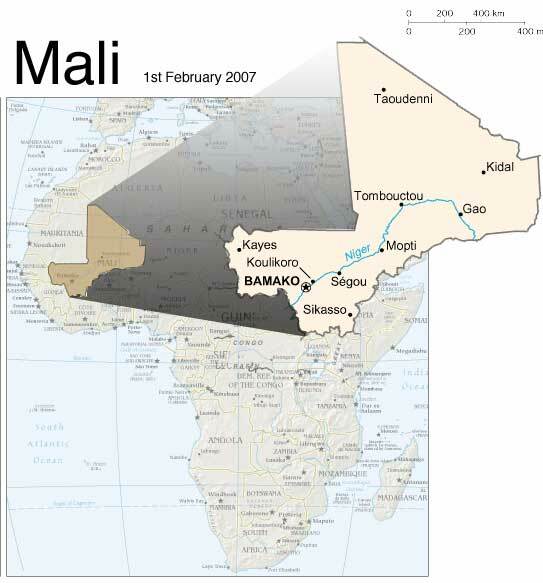 They had arranged the vehicle, a driver, and guide for their time in Mali and I was joining them for four days in the Dogon Country. 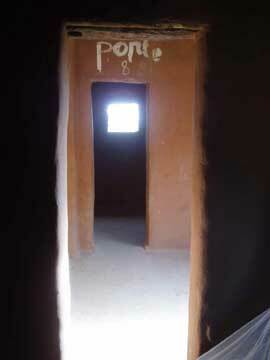 The Dogon people had been marginalised over the centuries, refusing largely to convert to the dominant Islam religion, and maintaining their distinct animist culture – helped in part by their isolation in their distinctive mudbrick villages built along the nearby Bandiagara escarpment. The original inhabitants, the pygmy ‘Tellem’ people, constructed their dwellings in the cliff face hundreds of feet up, the remains of which were clearly visible at regular intervals along the escarpment. It really was quite extraordinary to contemplate how the inhabitants would have had to either scale the cliffs or descend from the tops to the precarious and inaccessible dwellings. 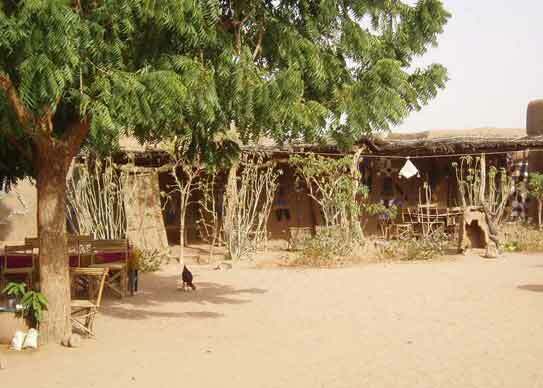 One theory is that before the arrival of the Dogon, who cut down the surrounding forest because of the threat from predatory animals and the need for agricultural land, access was gained by scaling tall trees growing next to the cliffs. Even this fails to satisfy the disbelief. It was also fascinating to note the similarity to cliffside dwellings of the ancient Anastasi culture I’d seen in southern Colorado in the USA. 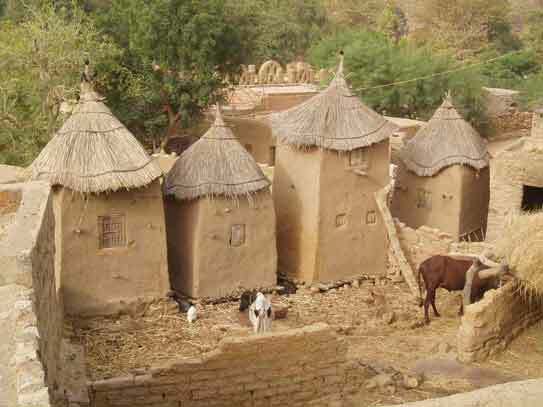 The Dogon arrived along in the fifteenth century and built their villages at the base of the cliffs, cultivating the surrounding desert. The distinctive buildings were conical in shape, with a straw ‘cap’, or roof. Theirs is the culture that has survived today, and still exists despite their opening up to tourism. I had feared we would be among loads of sightseers driven in for the day to take photos, but in fact the presence of foreigners wasn’t that obvious, most of the villages accessible only by foot or sandy track. That mightn’t have been good news to a couple of the more accessible villages, dominated as they are by tourist trade hustlers selling all kinds of locally made artifacts, and offering guiding services. Unavoidable when the tourist dollar, or rather euro, is so easily gained. The whole experience was a highlight of the trip to date, the scenery otherworldly. It was magical spending the days walking along the base of the escarpment in the dry heat, in the company of a local guide who ensured we observed the necessary proprieties in visiting some of these very traditional settlements. 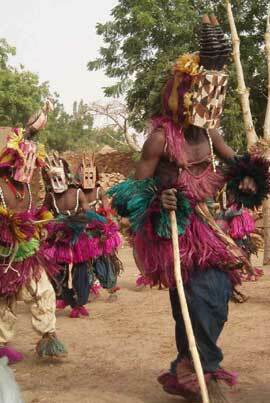 One afternoon we managed to make it to a village where a traditional ‘Dance of the Masks’ was to be performed. The sound of djembes echoed back from the cliffs, summoning the performers for their preparation, and when we arrived at a small clearing in the village to join the fifty or so locals for the spectacle, we were just in time. The anticipation built with the continuous drum beat. Pails of water were sprinkled across the arena to dampen the dust for the dancing to come. We waited with the villagers about twenty minutes, and then with a grand entrance they arrived. About ten men - women were forbidden to perform - with fiercesome large wooden masks and colourful material or leather strips covering their heads and torsos, representing various evil spirits or animals, engaged in an energetic, choreographed dance, leaping and shaking to the rhythm of the four drums, brandishing wooden staffs. At times one would make a sudden dash and scatter a group of encroaching kids, terrified. 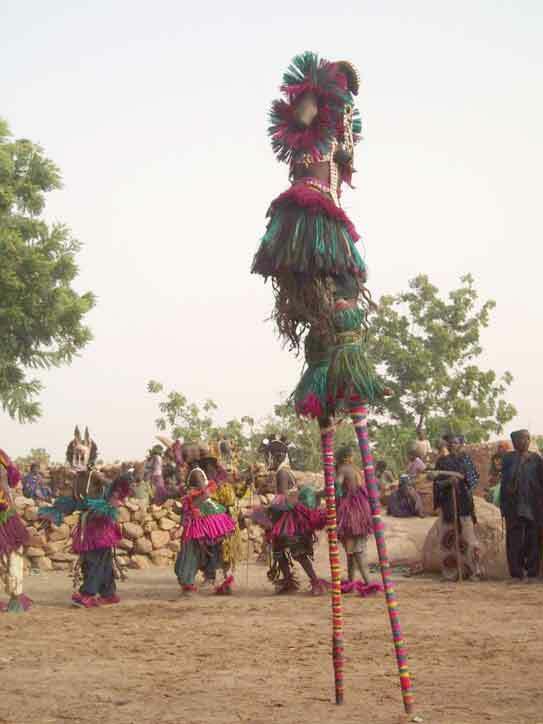 After a while two dancers on high stilts similarly adorned with masks entered the dance. The whole occasion was extraordinary to witness. I was just in awe, it was beyond my experience, I hadn’t seen anything as… elemental before! This appeared to be totally uninfluenced by anything contemporary, performed as it had been for centuries. We were told the dance symbolised the community dispelling bad spirits, allowing recently deceased relatives to pass on. Another morning, after about an hour climbing the escarpment we arrived at a small cluster of huts. Our guide hovered at the entrance to one of them, chatting for about fifteen minutes and paying his respects to the elderly chief before asking permission to proceed. A little further up we came upon a small family enclosure, and were asked to take off our footwear before entering a dusty circular space. A large rock backed it on one side, facing what appeared to be a mud built temple opposite. At the foot of that sat a very old ‘marabout’, or holy man. 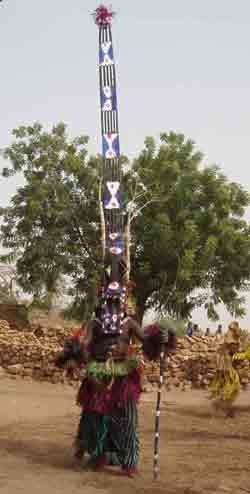 It was explained to us the marabout was selected from a village below, apparently having little choice in the matter. If he didn’t accept the role, a spell was put on him and he would perish. Once assuming the role, he could move a few family members up to look after his needs, but he could not leave this enclosure. Inhabitants from the region would visit with offerings, requesting advice, cures or blessings. And that is how he would live out the remainder of his days. We sat in the presence of this old man – he responded quietly to the odd question or comment put to him with a few words or faint smile – for about twenty minutes in which very little happened, but there was no discomfort. 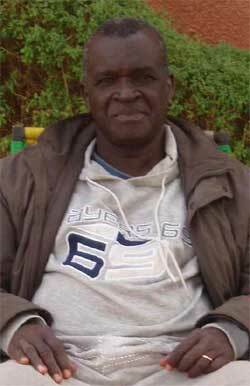 It felt we were indeed in the company of a holy man, someone who had given up his life to less worldly concerns. Before departing we left a small donation, which was gratefully received. 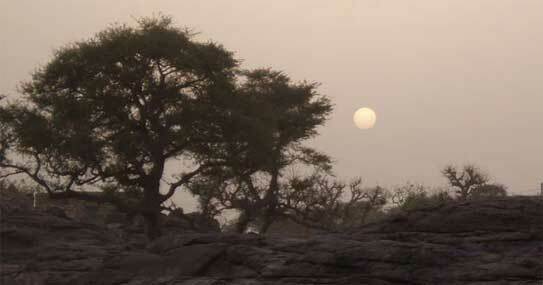 After a memorable four days we left the Dogon country, with a 4 am start. The pressure was on to get to Timbuktu that evening, in time for the commencement of the Festival-au-Desert the following day. 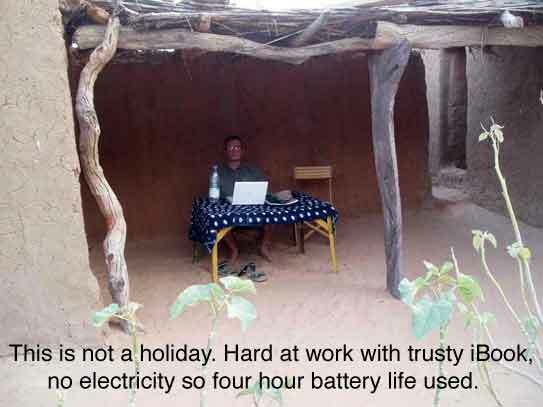 I was dropped off at Mopti, where I dallied a while – too long – getting my gear together, changing tyres back again to off -road, and making a last minute internet stop. Eventually leaving before lunch, I hit the road for Timbuktu! For now, my goal was to get to the Niger river ferry crossing before dark and I knew I was cutting it fine. Why did I always do this, and more importantly why at my age had I not learned? I knew it had something to do with some subconscious need for the adenalin surge that comes with rushing. Most of the time I manage, having only missed one plane that I can remember. But it didn’t make for a measured, controlled existence. Some day I would regret it, I reprimanded myself, hoping that day hadn’t come. Pausing briefly in Douentza for fuel – for the bike as well as the body as I knew it would be needed for the exertions ahead – I turned onto the piste. I had about three and a half hours of daylight left for the approximately 200 km journey north to the mighty Niger river and I knew I was taking a chance. The first hour was very manageable, the road not too sandy and I made decent progress. In my mind one thought was of relief - ah sure maybe it’ll be fine, just put in the hours and eventually I’ll get there in time. The other was more cautionary – make good time while you can, it will get difficult. There appeared to be one obvious track to follow, with various others running parallel. I would choose the main one for a while, with corrugations and ruts slowing me but at least a more solid surface, then try an alternative which was indeed smoother but sandier and softer – with less control. I discovered with pleasure the trick when, too late to avoid a wheel jarring collision with a hole, a quick application of the throttle and the power of the 650cc engine carried the bike over them. There had been no traffic at all for the first hour, and no habitation. I tried not to dwell on the uneasy feeling in the back of my mind that because of my late start I’d missed any 4x4 traffic going to the same destination as me. Certainly PJ&P would have long gone. If something happened to the bike out here, it would be a long wait for something to come along the next morning! Then ahead of me I saw what I took to be a loaded moped on one of the tracks and followed it, assuming it belonged to a local who knew the best route. Catching up it was with surprise I recognised it as another overland bike with panniers! We both stopped. Sean was an Australian, heading to Timbuktu as well. When he heard my accent, he guessed who I was, having read an internet travel forum where I had contributed. He had half expected me! Sean was riding an older, lower suspension BMW R65 roadbike, a workhorse with a great reputation for travel – but not in these off road conditions. When I saw his road tyres, I felt humbled and of course far better equipped with my F650 Dakar and TKC tyres. He was finding the going difficult, coming off regularly, and had crashed into a concrete track marker a half hour earlier, bending one of his cylinder head covers. He seemed to have recovered, was not leaking oil, and declared he’d plod along as he had powerful lights and didn’t mind continuing into the dark. After exchanging a bit more information I continued on at my pace, apologising but explaining it was going to be very tight for me with the remaining daylight. The going began to get tough with lots of sandy piste. I’d already had a couple of tumbles in the deeper sand, but most difficult of all … the dreaded washboard corrugations were getting very rough. These were serious, bone rattling, bike damaging, morale destroying corrugations. That went on for hours. The usual way to deal with corrugations is to take courage and open the throttle to about 80+ kph, which can serve to smooth out the bumps. But this of course means you have little control as contact with the surface is reduced. Upcoming holes, ruts and bends present interesting challenges! And at times when the corrugations get very deep even the speeding up trick doesn’t work. I had passed a broken down 4x4 earlier, and as we were hours from anywhere, paused to ask if they needed help. The driver shook his head sadly and pointed to a wheel - the tyre torn and in tatters off the rim. And apparently that was the spare. A little later, during this torture, I suddenly felt the bike stalling, losing power then pulling forward again. My first thought was maybe dirty fuel. I didn’t want to stop and risk not starting, so continued, hoping whatever it was would clear itself through the injector. And sure enough, after a couple of minutes the bike picked up power and continued fine. Shortly after, concern about the tyres caused me to glance down and check the rear, and my heart nearly jumped out of my mouth. Craning my neck around, what I could see from the seat was a piece of shredded rubber dangling down under the wheel well! Jaysus, I thought, the rear tyre’s been ripped! With a sinking feeling I pulled up, quickly going through the options in my mind. In an effort to travel this stretch more lightly I’d foolishly accepted the lads’ offer to put some of my gear, including tent, sleeping bag and spare tyres in the back of their 4X4 earlier in the day. Evening was approaching. Getting off the bike preparing myself for the worst, I burst out laughing with relief when I looked down. In preparing the bike in Dublin, a bit of Wavin pipe, extra storage space, had been secured where the original exhaust had been, and this had been shaken off. Some inner tube, which had been protectively stretched like a condom around it, was the piece of shredded rubber I glanced hanging down! The ‘interference with the fuel supply’ was in fact my rain gear which had been stored in the pipe, getting chewed up in the rear wheel. There wasn’t a trace of it left and I wasn’t going back to look for the remains! Some Tuareg was going to be scratching his head coming upon a length of Irish sewage pipe on the piste to Timbuktu. As the hours passed I kept the pace up, pushing the speed as much as I dared. This meant the bike got an awful hammering, and of course the risks of coming off increased. There were a number of close calls in the deeper sand, the front wheel wanting to pull aside, my elbows out trying to keep it straight. The sand was getting softer, my progress slower and I knew I would be riding in the dark which with my weak light I really didn’t want to do. I came off once at speed, managing to throw myself aside unhurt. The bike was only superficially damaged, although my remaining mirror was a casualty. Six o’clock came and went, night had officially fallen, and I was riding with my visor up to get the tiniest bit more visibility, my eyes slits to avoid the airborne evening bugs. I was finding it very difficult and was having to slow right down. And then eventually there it was, the moonlight reflecting off the water ahead as the road veered west along the banks of the Niger. It was now very sandy and difficult to ride without decent illumination. I didn’t know how long the track would continue along the river, but very fortunately for me it wasn’t too much further to the end, and it was with relief I saw the headlights of some parked vehicles a few hundred yards ahead. Indeed it was a queue for the ferry. Powering the weaving bike through the soft sand to the waiting cars, I embarrassingly came off one more time, though at that stage I was past caring. The welcome cheer from some of the 4x4 passengers as I arrived felt great, and to my surprise out of the darkness came PJ&P to clap me on the back in congratulations. I’d made it.